this is one of my favorite side dish recipes. one i get asked for a lot. it contains two things that are high on my happy list: feta cheese and artichokes. and it came from a pretty random place. when my husband and i lived in st. louis, we were at a fundraiser at a really nice retirement home. this was served along with a wonderful holiday dinner. i was so smitten with this dish that i snuck to the back to the kitchen and found the chef! i begged him to tell me his recipe and he very kindly obliged. i recited it to myself over and over until we got home and i could write it down. so here it is, a rich, buttery treasure smuggled from st. louis and taken with me everywhere we’ve been. cut potatoes into 1-inch squares and place in a large mixing bowl. add the rest of the ingredients to the bowl except the feta. mix well. spread mixture out on a large baking sheet and put it into the oven. cook until potatoes are brown & soft, about 40-45 minutes, tossing every 10-15 minutes. add feta and serve warm. when i made this recipe last week, it received a 10. from me. now i like food. a lot. maybe more than most people (or more than most humans should). but for it to get a perfect 10 rating by yours truly, that is exceptional. i made this for girls night (sadly, the hubby does not like fish – his loss) last week and we barely spoke as we devoured this dish. as i ate, i am sure i made some noises that might have been awkward if i had been amidst other company. this recipe is so full of flavor and wonderful texture. i love the combination of the olives and the artichokes mixed with the red wine vinegar and the crunch of the celery (which is usually not my favorite vegetable) is fantastic. also, i ended up having some of the caponata left over and it was great served as bruschetta on crispy french bread. in a large skillet, heat the olive oil over medium heat. add the onion and cook until translucent, about 3 minutes. add the celery and artichoke hearts and cook until soft and the artichokes are lightly browned, 3-4 minutes. add the tomatoes with their juices and olives to the pan. simmer over medium-low heat, stirring frequently, until the mixture thickens, 15-20 minutes. stir in the vinegar, sugar, and capers and season with a pinch of sea salt & a few grinds of pepper, to taste. let cook another 5 minutes or so. 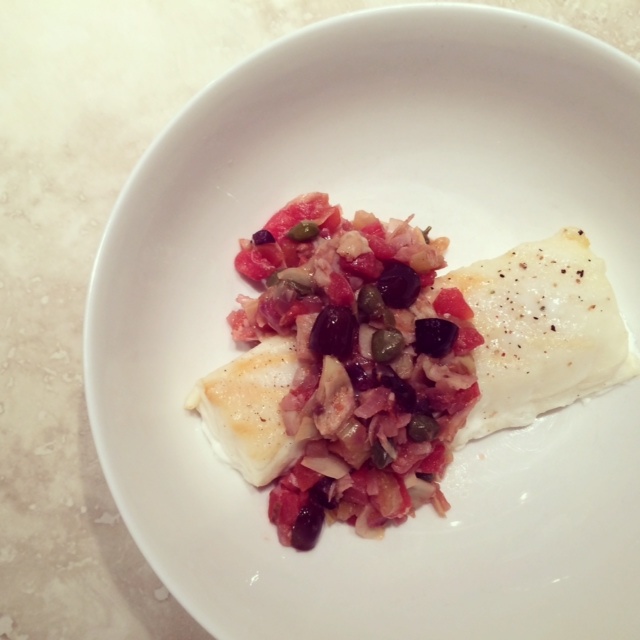 arrange the fish on a serving platter or individual plates and top generously with the caponata.